Nilüfer, one of the most prominent performers in the history of Turkish Pop Music was born on May 31st, 1955 in Cihangir. The first place she won in the Golden Voice Competition organized by the Hafta Sonu Newspaper she participated in 1970, when she was still a pupil of the Istanbul Italian High School, established her future. She made her first 45 rpm titled "Kalbim Bir Pusula" in 1972 from Odeon Records. However, she achieved her essential impact with her 45 rpm titled "Dünya Dönüyor" she made in 1973 and was elected the woman singer of the year. When she was only 17, the whole of Turkey was talking of her and she had received more awards than her years. 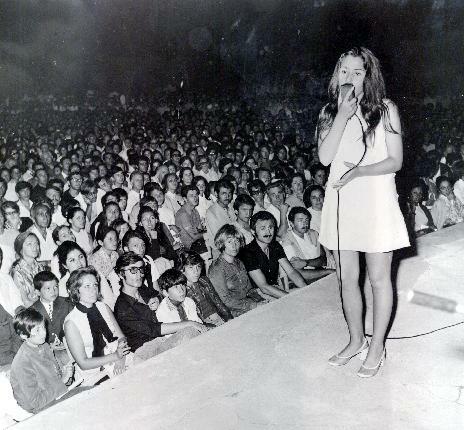 She had her first stage experience at the Izmir Fair taking stage among the team in which Zeki Müren was the star singer. Songs like "Göreceksin Kendini", "Aldanırım Sana", "Başıma Gelenler" in "Nilüfer74", her first album, which also included "Dünya Dönüyor" joined the ranks of unforgettable classics in the history of Turkish pop music. In 1975, accepting offers for making records from German producers she made the 45 rpms "Miss Nilüfer", and "Ali". On the same year she made the 45 "Oh Ya", with "Of Aman Aman" in 1976 and "Kim Arar Seni" in 1977. She had broken sales records putting the lists in an upheaval. In 1978, together with "Group Nazar" she represented Turkey in the Eurovision Song Contests in Paris on behalf of TRT. On the same year, with her long plays "Nilüfer Müzik" and "Nilüfer 15 Şarkı", an additional 25 songs also attracted attention. Her albums titled "Nilüfer'79", "Nilüfer'80" and "Sensiz Olmaz" were followed by her album "Nilüfer'84". Among the hits of the album were unforgettable songs like, "Varsa Söyle", "Dönsen Bile", "Kar Taneleri". With this album Nilüfer started to include Kayahan compositions in her work. Nilüfer, in 1985 made her album "Bir Selam Yeter". The most important feature of this album was that it included "Erkekler Ağlamaz", her first song in which she had written the lyrics and the music. In 1986 she joined the "International Mediterranean Song Contest" organized in Antalya Aspendos and singing Kayahan's composition "Geceler", she won the first prize for our country. In 1987 her album called "Geceler" was launched which reinforced her fame and made her known to the world. There were many hits in this album such as the "Geceler", "Tek Başına", "İspanyol Meyhanesi", "Sensiz Yıllarda" and "Seni Beklerim Öptüğün Yerde". The "Esmer Günler" she made in 1988 was followed by her "Sen Mühimsin" album in 1990 which again broke sales records. In her album called "Yine Yeni Yeniden" introduced in 1992, many songs such as "Şov Yapma", "Yeniden Sev", "Haram Geceler", "Kavak Yelleri" became hits and this album, selling more than one million copies took its place among the top sellers. Nilüfer worked with the best composers of the time in this album, such as Onno Tunç, Adnan Ergil and Kayahan. This album was followed by her album called "Ne Masal Ne Rüya" in 1994. Among the hits in the album were "Eğrisi Doğrusu", "Son Perde", "Sevgi Tam Olmalı", as well as the song titled "Bosna'da Bıraktım Kalbimi" made for the children in Bosnia. In her album called "Nilüfer'le", which she introduced in September of 1996, while she gave life to songs from Kayahan such as "Mavilim", "Çok Uzaklarda", she also worked with Adnan Ergil and Fahir Atakoğlu. With this work she was found worthy of many awards, with the Kral TV Video Music Awards at the lead, and was elected the best woman singer of 1996. On November 14th 1997, for the first time in Turkey a performer was elected as UNICEF's goodwill ambassador and Turkish representative. Nilüfer served in this task for many years. In February of 1998 she collected the hits she had sang in the 70's in a "best of" album titled "Yeniden Yetmişe". This album included 13 Nilüfer hits. Among those hits were classics such as "Dünya Dönüyor", "Başıma Gelenler", "Kim Arar Seni", "Ağlıyorum Yine", "Son Arzum". In April of 2001 her album titled "Büyük Aşkım" was introduced. Songs like "Söz Güzelim", "Beni mi Buldun", "Büyük Aşkım", "Anlat Arkadaşım" were the prominent songs in this album. In her album titled "Olur mu Olur mu? - Gözünaydın" which was introduced on June 19th, 2003 she once more enchanted her fans with her songs titled "Gözünaydın", "Hey… Bakar mısın? ", "Acılara Son", "Aşkım". In 2004 she realized a first in our country's music market in cooperation with the Odeon Company. Songs, some of which were not included in the albums from the 45 rpms and some which were shelved as "demo"s were transferred to disks from LPs. On December 5th, 2005 she introduced her album "Karar Verdim" in which her own lyrics and compositions were prominent. The performer, with this album, was awarded with a golden record by MÜYAP. In her single titled "Sen Beni Tanımamışsın" which she made in 2008, with the lyrics and song written by her she worked with Suat Ateşdağlı and Hüseyin Karadayı. Nilüfer, in her album "Hayal" she introduced in June of 2009, both included her own lyrics and compositions and also worked with many precious musicians. Names, each one as valuable in Turkey as the next, composers like Adnan Ergil, Mete Özgencil, Fahir Atakoğlu, Sinan Akçıl and arrangers such as Ozan Çolakoğlu, Devrim Karaoğlu, Mustafa Ceceli and Buğra Uğur came together for this album. In January 2010, Nilüfer recorded the single titled "Zalimin Kararı" whose lyrics and theme belongs to Sinan Akçıl and arrangement belongs to Ozan Çolakoğlu. In May 2010, Nilüfer's biography "that's all" which was written by Bircan Usallı was published. The album titled 12 Duets which was created by Nilüfer and rock musicians will meet with music lovers on February 3rd. With the exception of "Sensiz Olmaz", which was arranged by Attila Özdemiroğlu, the groups themselves arranged all the songs on the album. Upon accomplishment of Nilüfer 12 Duet, made by Nilüfer in 2011 together with Rock musicians and soloists and released by DMC, the album titled Nilüfer 13 Duet was made in February 2013. In this album, successful musicians of Rock music came together again. In the album, the song named "Son perde" was arranged by Mustafa Ceceli, while all other groups made their own arrangements. Following two years of working, Nilüfer released her new album "Kendi Cennetim" in May 2015. The album which consists of brand-new songs was released by DMC. Nilüfer sang Sezen Aksu and Nazan Oncel songs for the first time on this album. Another feature of this album is that Nilüfer added two songs by amateur composers to her repertoire. These two songs were obtained following Nilüfer's calls for amateur composers to send her their works. The album has songs by Şehrazat and Adnan Ergil, and Nilüfer also wrote a song for this album.